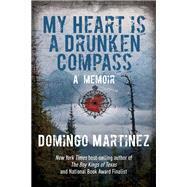 With his trademark tragic-comical voice and arresting storytelling, Domingo Martinez once again delivers a deeply personal memoir full of wry asides and poignant, thoughtful reflections in his new book My Heart Is a Drunken Compass. His first book shockingly ended with his fiancé Stephanie plummeting off the side of an overpass in Seattle, after having a seizure while driving. He now chronicles this painful episode in his life, with flashbacks to their tenuous romantic relationship, and how her accident and subsequent coma ultimately causes him to unravel emotionally. This pivotal moment, which began with an alarming call in the middle of the night, parallels another gut-wrenching experience from the past when his youngest brother’s life hangs in the balance. Martinez once again brilliantly examines the complicated connections between family, friends, and loved ones. Feeling estranged from his family in Texas over the years, isolated and alone in Seattle, he turns to writing as a therapeutic tool. The underlying themes of addiction and recovery and their powerful impact on family dynamics also emerge within the narrative, as he struggles with his inner demons. These two traumatic life events actually bring Martinez closer to the family that he has in many ways spend years trying to deny, strengthening their bonds and healing old wounds. When Martinez falls apart completely, he finds his family, his redemption, and a new beginning with the love of his life, who encourages him to write his way out of the pain in order to save his own life. Domingo Martinez is the New York Times bestselling author of The Boy Kings of Texas and was a Finalist for the National Book Award. The Boy Kings of Texas has been optioned by HBO for an original series through Salma Hayek’s production company, Ventana Rose. Martinez’s work has appeared in Texas Monthly, The New Republic, Saveur Magazine, and more. He has also appeared on NPR’s All Things Considered and This American Life as well as The Diane Rehm Show.